Using this Cooking Light recipe I saw on Food alla Puttanesca (who saw it on Cheap Healthy Good), I whipped up these simple Light Buttermilk Pancakes. I put some of the batter in a squeeze bottle. I then drew the heart shape, and wrote I (heart) U inside it. I wrote this because an I, a heart, and a U would look the same both ways! Let the outline cook for a little while, then fill it in with the rest of the batter. Because the outline is drawn first, it cooks a little longer, and gets darker than the rest of the pancake. I saw this done in the Jan/Feb issue of Food Network magazine. Click here to see more on Food Network’s site. So pretty – Happy Valentine’s Day! I love these Erin! 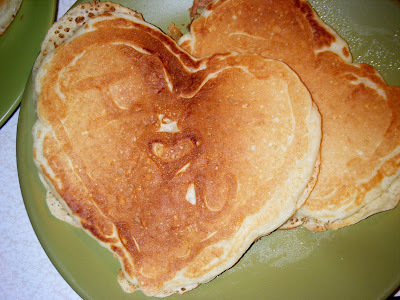 Avery has me make smiley faces and mickey mouses all the time out of pancakes but I had never thought of hearts. 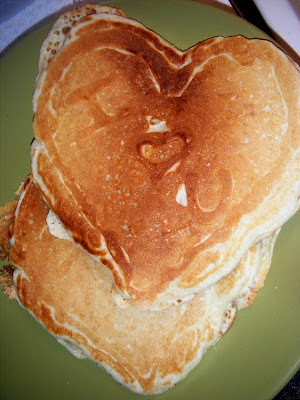 I think I will have to make these for Jason and the kids in the morning! 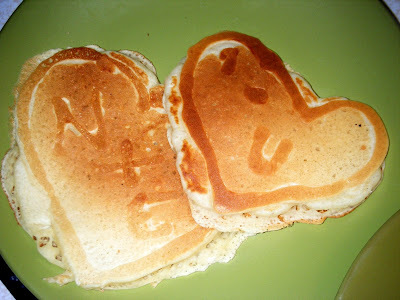 I have never written or drawn on my pancakes, but am now imagining the possibilities. Looks like fun! Guy Fieri did an episode where he was in a restaurant, the cook drew him in pancake. My mom did this when I was a kid, we had hearts, silver dollars, bunnies, bears, anything we wanted to get us to eat breakfast. She had 8 kids. I did this with my kids, I made their letters of their first names, they LOVED that!! !